There's a good reason Costco has more than 81 million members who are willing to pay $55 — or $110 — annually to shop at the warehouse club. It offers high-value products at low prices. In fact, Costco claims to offer its members the lowest possible prices. So when you shop at Costco, you know you're going to get a pretty good deal. To get the best deals, though, it pays to know the secrets to shopping at this warehouse club. Here are 10 little-known ways to save money at Costco. Costco is known for not marking up items more than 15 percent. However, you can ensure that you're getting the lowest possible price at the warehouse club by paying attention to the final numbers in the price. Items ending in 99 cents are regularly priced, but those ending in 97 cents might be clearance and an even better deal, said consumer expert Andrea Woroch. Prices that end in 9 below 99 cents — as in 59, 69, 79 cents — can indicate a special offer from the manufacturer and competitive pricing over other discount retailers, said Jim Wang, founder of WalletHacks.com. Costco has an unwritten price adjustment policy that members can take advantage of to get a refund for the difference in price if an item they buy is marked down within two weeks or so, Wang said. So hang onto your receipts, especially if you buy seasonal items before they are marked down. Costco does have a liberal return policy, so you could conceivably return an item purchased at regular price and re-purchase it at the sale price. But Wang said that this creates hassle for everyone. "Costco would much rather offer an adjustment," he said. You don't necessarily have to pay the membership fee to shop at Costco and take advantage of its low prices. You just have to have a friend who is a Costco member and is willing to get a Costco Cash Card and load it for you (with your cash, of course). Non-members can use these cards to shop at Costco, and they can even exceed the total value as long as they pay the remaining balance in cash or with an accepted debit card, said Woroch. "This is a good perk for a non-member who is looking for a specific deal on a big-ticket item like a TV bundle, furniture or home appliance," she said. If you frequently pay with credit cards to rack up points and earn rewards, you might not be able to use your favorite rewards card at Costco stores, which only accept American Express cards. However, Costco is switching to Visa as its card processor in April, Wang said. You don't have to worry about which card you use, though, when you shop at Costco.com because it accepts all cards. So if you want to rack up credit card rewards points at Costco, do your shopping on the retailer's site when possible. Costco is a go-to spot for many who want to avoid a big markup on alcohol — especially wine. Its house brand Kirkland Signature wines are an especially good value because they are sourced from brand-name wineries. And you don't necessarily have to be a Costco member to buy them. If your state prohibits the forming of alcohol clubs, you can buy wine, beer or liquor at Costco's dramatic savings without a membership, Woroch said. Most Costco stores where such membership requirements are prohibited will offer a separate liquor store with its own entrance. You might also be able to get low-cost prescription drugs at Costco's pharmacy if you aren't a member and live in a state that prevents pharmacies from requiring memberships. Costco devotes a few shelves in its stores to items that have been returned but still are saleable, rather than sending them back to the vendor or a liquidator, Wang said. And the markdowns are dramatic. You typically can find these returned items near the automotive, household or sporting goods sections. If you're planning a wedding or event that requires a lot of flowers, you can get a good deal on bulk flower purchases at Costco. Furthermore, Teri Gault, author of "Shop Smart, Save More," said she discovered when planning her son's wedding that she could get better prices by buying directly from Costco's floral supplier — Kendal Floral Supply at kmsfloral.com — and picking her order up at Costco. Costco offers health care clinics at its stores, where members can be screened for diabetes, osteoporosis, heart disease and lung disease for free. It posts a schedule of when, where and what type of screenings will be held on the Costco.com pharmacy page under "Health and Wellness Clinics." Woroch said that she always checks Costco's travel offerings before booking a trip for work or leisure. Through Costco Travel, members can get deals on cruises, rental cars and vacation packages. When Woroch rented a car through Costco's travel site for a trip to Hawaii, she saved more than $200 on a week-long rental in Maui. 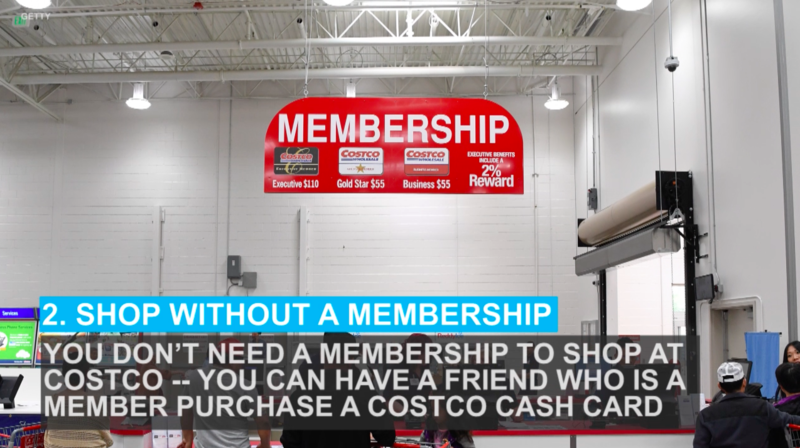 If you've balked at the $110 "Executive Membership" annual fee, but are a regular Costco shopper, you could be missing out on a chance to have your membership paid for you. Executive members get an annual 2 percent reward — or cash back — on most purchases. Wang said if you spend $2,750 a year, you'll get $55 back — which is the difference in price between the regular and executive membership. If you spend $5,500 a year (about $460 a month), you'll get $110 back, which covers the cost of your membership. If you don't spend enough to get a rebate of $55, Wang said you can visit the customer service desk to get the difference back.